This sentinel is sort of special, and it has made the news just a few months ago – all because of the earplug, a tell-tale build-up of wax that accumulates in the ear canal and can be over a foot long. By examining the earplug, a lifetime story of exposure to stress and pollutants can be unveiled along with the whale’s age – a finding recently published in Proceedings of the National Academy of Sciences. 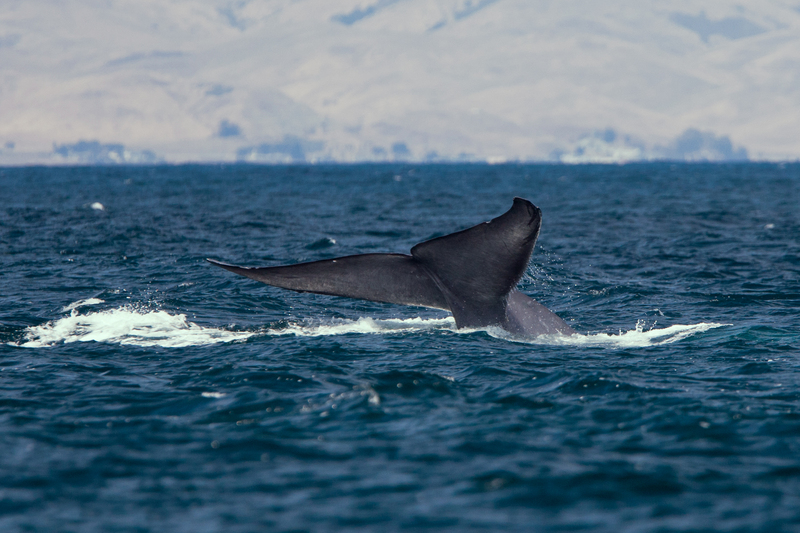 The article, “Blue whale earplug reveals lifetime contaminant exposure and hormone profiles,” is the result of a collaborative study that included researchers from Baylor University, the Santa Barbara Museum of Natural History and the Smithsonian Institution. The earplug is sealed off from the external environment, and remains in place for the entire whale’s life. It is similar to a tree ring – the earwax is continuously produced, forming alternating dark and light layers that represent seasons of feeding or migration, with each layer corresponding to six months of the whale’s life. A few years ago, the researchers collected the earplug from a dead male blue whale that washed ashore on a California beach after being struck and killed by a ship. By analyzing the earplug layer by layer using novel analytical methods, the researchers found presence of testosterone, the stress hormone cortisol, mercury, and organic contaminants such as pesticides and flame retardants. They found that, at age 10, the whale became sexually mature, as indicated by increased testosterone levels that were accompanied by a spike in cortisol. The researchers believe that the spike might have been caused by breeding competition or by the social bonds the whale formed at that time. In addition, they discovered that levels of stress hormones doubled over the whale’s life. Significant exposure to anthropogenic chemicals such as dichlorodiphenyltrichloroethanes (DDT), chlordanes, polychlorinated biphenyls (PCBs) and polybrominated diphenyl ethers occurred in the early, most vulnerable stages of the whale’s life, most likely when the whale was still nursing. The earplug analysis also showed evidence that the whale had been exposed to mercury two times, first at around age 5 and then again at around age 10. Most pollutants could also be identified in the blubber, confirming that both blubber and earwax can be used to reliably identify different types of exposures – however, only the earplug can be used to track the timing of exposure. These studies will be extended by analyzing earplugs collected from dead beached whales all around the world – indeed, many other species of baleen whales continuously accumulate layers of wax similarly to blue whales. In addition, the researchers plan to go back in time and analyze archived museum earplug samples that were harvested in the 1950s. This sounds like a potential routine system to determine contaminants to which whales are exposed during their lifetimes and may indirectly reveal what’s present in the ocean. It would be worthwhile to organize a global system to collect earplugs from all whales found on beaches. This ecotoxicologic assessment opportunity reminds me of a burning question I have had of another possible biomonitoring organism for freshwater. Freshwater mussels such as Margaritifera falcata (the Western Pearlshell) are an almost ideal biomonitoring organism. The genus is widespread around the northern hemisphere, and is especially associated with the range of the salmon species. Modern sclerochronologic elemental assessment of growth increment histories recorded within the shell calcium hold a wealth of potential for environmental assessment of many contaminants. this is a well established, and growing, field. Usually the hard calciferous shell is the target tissue for ICPMS determinations, however, another possibility occurs to me that perhaps since the hinge ligament incremental growth is formed similarly, but out of proteinaceous material, that this might be a good research subject for potential use in organic contaminant biomonitoring histories that are site-specific in streams. Is any of this currently under research? Do you know about any method for it? I have read comments from some mussel researchers about the hinge ligament growth increment record being perhaps even more consistent than the sclerochronologic record in the calcium of the valves, which is proving to be very useful for ecoassessment. The calcium seems to be mobilized from the shell if the organism is under calcium stress, perhaps for metabolic needs or reproduction, and this can result in a lack of adequate growth increment formation. Usually, this is not too much of a problem in a healthy population. The growth increments in the hinge are clearly visible in the proteinaceous material. Perhaps similar Laser Ablation ICPMS or similar assessment techniques could ‘read’ the molecular contents for a site specific record of exposures (actual uptake) over time. What organics might reasonably be expected to be recorded? Perhaps harmful algal bloom toxins (BMAA, microcystins, etc.) or, perhaps pesticides and their degradates. Presumably there could be a correlation made on some aspects of common content within the two increment histories that could also tie in the timelines and correct them for questionable segments. If any work is already being done, ‘BioIncrements’ in Germany (Bernd S.) would probably know, or he ‘could’ say the whole idea is off base. In this country, checking with Chris Ingersoll USGS would be a good possibility. The possibility of BMAA toxin being recorded, is very interesting as it is accumulative over time, known to associate into protein, appears to be very neurotoxic and associated (or even possibly causative) of such devastating disorders as ALS, PD, and AD. If relative spatial and temporal histories of exposure are recorded in many long-lived mussels, it could go a long way toward teasing out neuropathology causation…. unless the whole idea is all wet for some obvious reason. Certainly would not get clear to causation, but could clarify a lot of points… if it were to become a valid biomonitoring tool. If a certain number of humans are drinking water from a lake on a regular basis, and a higher incidence of neuropathology is detected via epidemiology, would the harmful algal bloom toxins (cyanobacterial and also perhaps diatom) be recorded in the freshwater mussel population hinge ligament growth increments over the last seventy five or one hundred years? Would this not be a very potentially useful biomonitoring tool? The mussel sclerochronologic calciphilic toxic contaminant history is already begining to be explored for metals that associate with calcium. The protein hinge record might just be a continuous uptake record of some of the organic pollutants in the lake. If these two biomonitoring methodologies were to be cross-checked they might go a long way to clarify the epidemiology. An epidemiologic study of lake association with increased ALS incidence has seemingly suggested that there is possibly significantly increased risk living in proximity to such lake environments. If water is consumed, and showers taken, with lake water that has had BMAA, (or other HABs toxins) either chronically low level, or acute ‘HABs health risk’ levels, it would be very helpful to know what the mussels close to the intake pipes had been exposued to through time. Seems like a very good research potential for someone. Neurotoxic metals, as well as BMAA have been main suspects in ALS disease research as being potentially causative rather than just associative.